Remedy Cleansing Body Lotion cleanses, moisturizes, protects and nourishes the skin in one application. No-Rinse Cleansing Body Lotion moisturizes and provides light protection from incontinence and leaves skin feeling fresh and silky. Convenient trigger spray yields more than 280 sprays. 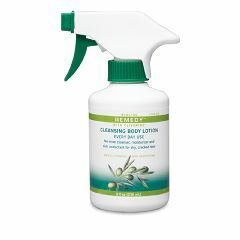 Remedy Cleansing Body Lotion no-rinse formula easily cleanses and removes sticky barriers and pastes, avoiding unnecessary friction on the skin. Added dimethicone helps protect skin from light incontinence and avoid e-TEWL. Dries well, Nice fragrance, Does not spray mist unless held far away and that leaves a mess on the floor. Don't want to spray in shower because it would make the floor too slick. Overall it is still a 4 star! My dad likes this spray because he doesn't have to reach as with a lotion. Also, it keeps his skin hydrated.